In March 2018, French scientists reported a steep decline in the country's bird populations, primarily as a result of agricultural activity. Causes include the increase in monoculture, detrimental land-use policies and, perhaps most importantly, the growth in the use of powerful pesticides such as neonicotinoids, which, by killing off insects, reduces the bird population by reducing the food available to them. With an average decline of 33%, a host of once-common farmland bird species is disappearing—the grey partridge, the Eurasian skylark, the meadow pipit and many others. Although devastating, this news was no surprise to scientists at Ecopotential, an ecosystem monitoring project that tracks protected areas around the world to analyse environmental shifts. As part of their work, researchers analysed data from the Camargue natural reserve near Arles in southern France. Sandwiched between the Mediterranean sea and the mouth of the Rhone, the wetland reserve is Western Europe's largest river delta. Surrounded by a large cultivated area, the Camargue wetlands have been a haven for wildlife and birds since becoming a protected area in 1927. 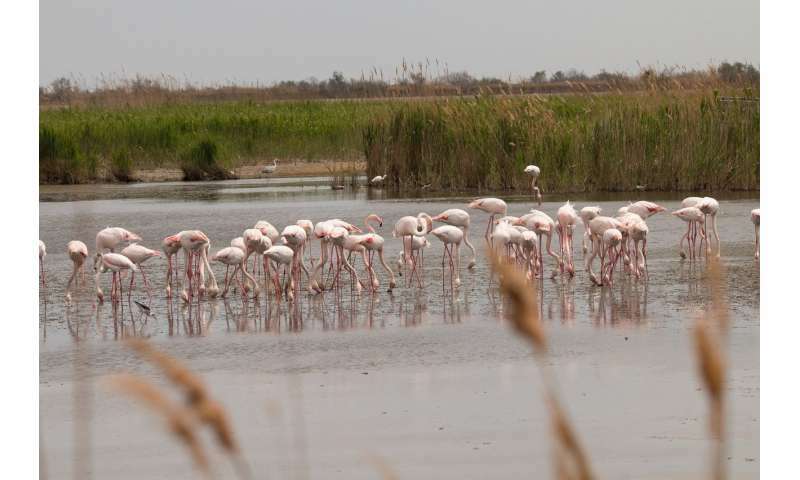 Now, however, a combination of agriculture and rising sea levels are damaging Camargue's pristine wetlands, home to dozens of bird species and France's only breeding colony of flamingos. Ecopotential uses satellite data from powerful Sentinel satellites launched by the European Space Agency in 2014, which allows researchers to observe minute variations in protected habitats with sensors that can focus on areas as small as 10 square metres. Dr. Antonello Provenzale, director of the Institute of Geosciences and Earth Resources in Pisa, Italy, is the project's coordinator. The scientific community has used satellite imagery for at least 30 years, he says, but this project integrates the data with local measurements to create rich maps of information that give practical help to those working on the ground. Environmental change is happening more quickly than the researchers had envisaged, with protected areas—and the species they shelter—under pressure from a number of different angles at once. Climate change isn't the only problem, although it is significant. Increased use of land for agriculture, encroachment by invasive species and poaching are combining to accelerate its impact. The trajectory of the tropical tiger mosquito, a pest responsible for transmitting illnesses like dengue fever and the Zika virus, is one example. The insect made its way to Europe from Southeast Asia by train, boat and even car, independent of climate change—but the fact that it found a warm and convenient place to breed enabled it to gain a foothold in Europe. Change itself is not bad, as Dr. Provenzale points out. But the rate of change and the manner in which it is occurring puts ecosystems at risk. It also has the effect of reducing the net benefits these environmental resources offer humans—so-called 'ecoysystem services'—such as providing and purifying our air and water, capturing carbon dioxide gas, preventing soil erosion and providing practical resources like raw materials, wood and food. One of the world's most essential ecosystem services is water, a basic element in human survival. Another monitoring project, the Satellite-based Wetland Observation Service (SWOS) coordinated by German space company Jena-Optronik, is also using data from ESA Sentinel satellites to chart what is happening in the world's wetland areas. Wetlands are home to more than 100,000 types of amphibians, reptiles and birds. As ecosystems, they are also among the most at risk from human activity. Since 1900, 64% of wetlands are estimated to have disappeared, and as the world's population rises they are increasingly in demand as sources of water and for agriculture. The threats to wetlands from human activity are varied and imposing—irrigation, settlements whose populations take water for drinking, or the conversion of natural wetlands for artificial purposes such as rice paddies. SWOS develops standards and tools for the satellite-based analysis of the ecology of wetlands and provides information to decision makers on the ground. One region the project focuses on is Azraq in Jordan, a permanent oasis around 100km from Amman, the capital of Jordan, with a population of 4 million. In 2014, Azraq became home to 36,000 refugees from Syria, in a camp set up by Jordan and the UNHCR—which placed increasing demands on the fresh water oasis. Azraq, meaning blue in Arabic, was once a lush parkland hosting cheetah and gazelles—creatures now decimated by hunting. The oasis itself is so depleted that Jordan has begun to pump water from another source in the south of the country. It's a conundrum local people are trying to resolve as they seek a balance between competing human and ecological needs, says Kathrin Weise, the project co-ordinator of SWOS. She stresses that SWOS is not a political project but provides information and recommendations for policymakers.